Another new study found that U.S. production of corn (a.k.a. maize), much of which is used to feed livestock and make biofuel, could be cut in half by a 4˚C increase in global temperatures—which could happen by 2100 if we don't reduce our greenhouse gas emissions. If we limit warming to under 2˚ C, the goal of the Paris climate accord, U.S. corn production could still decrease by about 18 percent. Researchers also found that the risk of the world's top four corn exporters (U.S., Brazil, Argentina and the Ukraine) suffering simultaneous crop failures of 10 percent or more is about 7 percent with a 2˚C increase in temperature. If temperatures rise 4˚C, the odds shoot up to a staggering 86 percent. "We're most concerned about the sharply reduced yields," said Peter de Menocal, Dean of Science at Columbia University and director of the Center for Climate and Life. "We already have trouble feeding the world and this additional impact on crop yields will impact the world's poorest and amplify the rich/poor divide that already exists." Eighty percent of the world's crops are rainfed, so most farmers depend on the predictable weather agriculture has adapted to in order to produce their crops. However, climate change is altering rainfall patterns around the world. 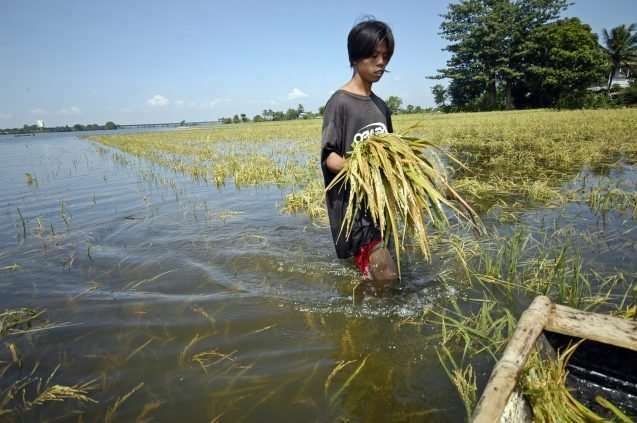 Flooding resulting from the growing intensity of tropical storms and sea level rise is also likely to increase with climate change, and can drown crops. Because floodwaters can transport sewage, manure or pollutants from roads, farms and lawns, more pathogens and toxins could find their way into our food. About 10 percent of the crops grown in the world's major food production regions are irrigated with groundwater that is non-renewable. In other words, aquifers are being drained faster than they're refilling—a problem which will only get worse as the world continues to heat up, explained Michael Puma, director of Columbia's Center for Climate Systems Research. This is happening in major food producing regions such as the U.S. Great Plains and California's Central Valley, and in Pakistan, India, northeastern China, and parts of Iran and Iraq. "Groundwater depletion is a slow-building pressure on our food system," Puma said. "And we don't have any effective policies in place to deal with the fact that we are depleting our major resources in our major food producing regions, which is pretty disconcerting." The ultimate effect of rising heat depends on each crop's optimal range of temperatures for growth and reproduction. If temperatures exceed this range, yields will drop because heat stress can disrupt a plant's pollination, flowering, root development and growth stages. Climate change will also enable weeds, pests and fungi to expand their range and numbers. In addition, earlier springs and milder winters will allow more of these pests and weeds to survive for a longer time. Plant diseases and pests that are new to an area could destroy crops that haven't had time to evolve defenses against them. For example, new virulent mutant strains of wheat rust, a fungal infection that had not been seen for over 50 years, have spread from Africa to Asia, the Middle East and Europe, devastating crops. While higher CO2 levels can stimulate plant growth and increase the amount of carbohydrates the plant produces, this comes at the expense of protein, vitamin and mineral content. Researchers found that plants' protein content will likely decrease significantly if carbon dioxide levels reach 540 to 960 parts per million, which we are projected to reach by 2100. (We are currently at 409 ppm.) Studies show that barley, wheat, potatoes and rice have 6 to 15 percent lower concentrations of protein when grown at those levels of CO2. The protein content of corn and sorghum, however, did not decline significantly. 540 million people around the world rely on fish for their protein and income—but seafood will be impacted by climate change, too. Since 1955, the oceans have absorbed over 90 percent of the excess heat trapped by greenhouse gas emissions in the atmosphere. As a result, the ocean is warmer today than it's ever been since recordkeeping began in 1880. Off the U.S. northeastern coast, American lobster, red hake and black sea bass have shifted their range an average of 119 miles northward since the late 1960s. In Portugal, fishermen have recently caught 20 new species, most of which migrated from warmer waters. And Chinook salmon, usually found around California and Oregon, are now entering Arctic rivers. Moving into new territory, however, these species may face competition with other species over food, which can affect their survival rates. The range shifts are affecting fishermen, too, who must choose whether to follow the fish they're used to catching as they move north or fish different species. As these ecosystems change, fishing regulations are having a hard time keeping up, jeopardizing the livelihoods of fishermen whose quotas for certain species of fish may no longer be relevant. According to research being done at Columbia's Center for Climate and Life, ocean warming and acidification may end up restructuring microbial communities in the ocean. Because these sensitive microbes are the basis for the global food chain, what happens to them could have unforeseen and huge impacts on our food supplies. Aquaculture of fresh water species is also affected by sea level rise as saltwater can move upstream in rivers. For example, in the Mekong Delta and Irawaddy region of Vietnam and Myanmar, the booming catfish aquaculture could be affected by saltwater intrusion. If this occurs, fish farms would have to be moved further upstream because catfish have little tolerance for saline conditions. Some higher latitude areas may benefit and become more productive, but if emissions continue to rise, the outlook for food production from 2050 to 2100 is not good. Wealthy nations and temperate regions will probably be able to withstand most of the impacts, whereas tropical regions and poor populations will face the most risks. Children, pregnant women, the elderly, low-income communities and those with weakened immune systems or chronic medical conditions will be most susceptible to the changes in food access, safety and nutrition. "Food security is going to be one of the most pressing climate-related issues, mainly because most of the world is relatively poor and food is going to become increasingly scarce and expensive," said de Menocal. "So what kind of solutions can science provide to help?" Columbia's International Research Institute for Climate and Society is leading a project called Adapting Agriculture to Climate Today, for Tomorrow, or ACToday. Part of Columbia World Projects, ACToday will help to maximize food production and reduce crop losses by more precisely predicting and managing flood and drought risk, improving financial practices, and, when a food crisis unfolds, identifying the need for relief efforts earlier. The project introduces state-of-the-art climate information and prediction tools in six countries: Ethiopia, Senegal, Colombia, Guatemala, Bangladesh and Vietnam. In case of a significant disruption in the global food system, there is no agency within the U.S. government whose responsibility it is to take charge, said Puma. His focus has been on trying to understand potential disruptions, which could be related to extreme weather, the power grid, conflict, or other factors. "We want to understand the food system in greater depth so we can identify vulnerabilities and adjust the system to deal with those," he said. Working with colleagues at the Potsdam Institute for Climate Impact Research in Germany, he is building quantitative economic models to examine vulnerabilities in the food system under different scenarios; they will use the tool to explore how altering certain policies might reduce the vulnerabilities of the food system to disruptions. The Center for Climate and Life is putting its efforts into building bridges between the business community and the science community in New York, to help clarify for investors the financial risks and opportunities of climate change. Large investment firms with long-term views have trillions of dollars in assets that could be jeopardized by climate change. De Menocal believes more intelligent investment strategies can be pursued with a science-based approach. "If you engage the largest deployments of money on the planet, that's what's going to shape behavior," he said. "If we can educate them about how climate change will impact things that matter to people, then they can act on that knowledge in advance of these things happening."